Would you trust these LED headlights? Thoughts on these for replacements? Or would this overdraw the already topped out SWing fun electrical system? Actually at 40W draw they will draw less than the original bulbs will. I think your good as long as the lumes are as high as original brightness. The electrical systems on the swings are wired to be at full draw all the time and dump all the excess out before the battery through heat, so when you put something drawing less power, it equals more heat. Just a thought. There is more to consider then electrical draw, we have 440 watts of alternator power, so we have enough power for additional lighting and heated grips etc. These will not fit physically, the reflector assembly in the wing is designed to use a standard H7 with the Honda adaptor. This makes the base close to 3/8" thick where the wire retainer clamps it in. It also uses a different plug spacing (hence the adaptor). 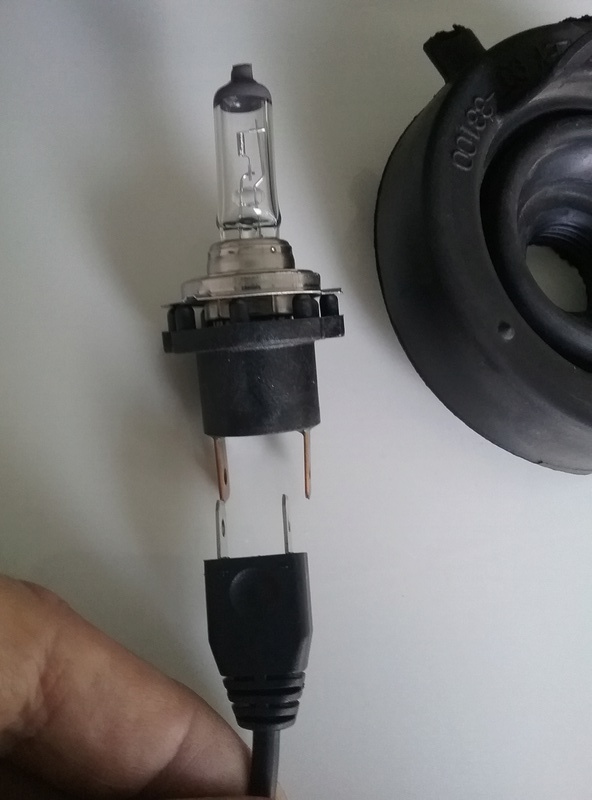 I've tried using these bulbs, and had no success, I decided not to try to retrofit any LED headlights. I added 10w LED driving lights, and changed to Sylvania LED's for the stop/tail and rear turns. To load compensate the LED turns on the rear I put in yellow halogens in the front positions. If you need more forward light, just use the 85w Phillips Powersport bulbs and add the LED driving lights to add side fill lighting. 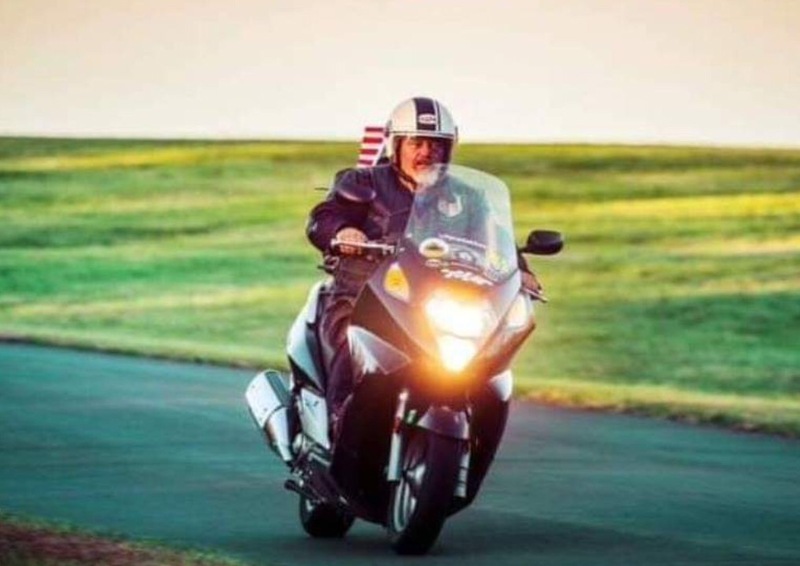 All the experience here with the LED Head lights has been negative, LED's seem to be OK in other areas of the Fellows bikes, But negative for many reasons in the head light attempts. I suggest the conventional lamps until something better is devised. Thanks for the input fellas, I just wanted a brighter light. I am grabbing a Phillips Powersport as Sidewinder Pilot mentioned above. Osram also make brighter replacements, particularly the "Nightbreaker." Please remember one thing with normal incandescent bulb at least, brighter is generally hotter, you don't want warped reflectors. Correct, as a generalisation. The halogen Osrams I mentioned are 55watt items per the OEM spec, so shouldn't be a problem. I ran the 85w bulb in the lowbeam position and a 65w as the highbeam for several months, then switched positions several months ago. I have had no problem with heat warping or wiring issues in the nearly 2 years/40,000 miles with these bulbs. BTW, my 85w bulb package was labeled "For off-road use only"
I fitted Osram Nightbreakers and they're very good, but if I wanted LED headlights it would be simpler to trade in the Silver Wing for a more modern design maxi scooter that has partial or full LED lights as OE. Same with HID, even if you cobbled some way to install them with some sort of spacer, the curvature of the reflector is designed for the size of the filament and it's relative placement. You would likely either have an indistinct patch of light, or the focus would just glare at oncoming traffic. ..........However, If one where really, really hell bent on LED upfront, you could cut away the back of the reflector assembly and imagineer a mount for a big LED driving light to shine through the front lens. I'll just stick with the originally engineered, universally available and easily replicable halogen. The only good way to upgrade a halogen light is to retrofit HID projector. There's generally options available to install them in place of the halogen bulb without much trouble. Just make sure there's room for it. The last I've seen there aren't any good options for LEDs. It doesn't (mis)use the original reflector, so there's no glare. All the fellows here in Florida that I work with have had poor results trying to change over to LED Headlights, Some have spent a lot and wasted a lot of time. Bulbs are best and easily replaced. Happy motoring lloyd 193. Silverwing electrical system will take anything you throw at it. In 14 years I have never heard of anyone overloading it, and believe me people have installed everything you can think of. These are pricy but the cream of the crop in terms of brightness. Have them on my Honda NM4 and they are amazing. If you really want to go big, check out the Sevina Model @ 7500 Lumens EACH. Why bother with LED lights at all on a maxi scooter that's been discontinued in the original FSC/FJS versions and doesn't have them on the later SW-T. For the amount of night riding the average owner does, I've found uprating the OE headlamp bulbs gives a great improvement, especially over a pitch black section rural section of the Pennines I occasionally ride over at night. Adding bolt on LED lights wouldn't add much, but may be useful to switch on when it's foggy. I've no idea what new maxi scooters are imported into the US, but looking for example at the current crop of new Kymco, Yamaha, and SYM models, they're all equipped with full or partial LED lights front and rear. The new Suzuki Burgman 400 is similarly kitted out for 2017, and a maxi with it's LED 'eyebrow' lights illuminated looks far more clean looking and impressive than a maxi with bolt on LED lights cobbled on to the fork legs or wherever the owner can fit them. All these bolt on LED's look more at home on the current crop of adventure bikes which seems to be the market they're aimed at. So when I finally summon up the interest to trade in my Silver Wing, and I'll admit to having the odd look at more up to date maxi scooters in dealers showrooms recently, the ones fitted with full or partial OE LED lights front and rear and daytime running LED's would be priority choices. The last picture on your link is a good demonstration of why you shouldn't do this. 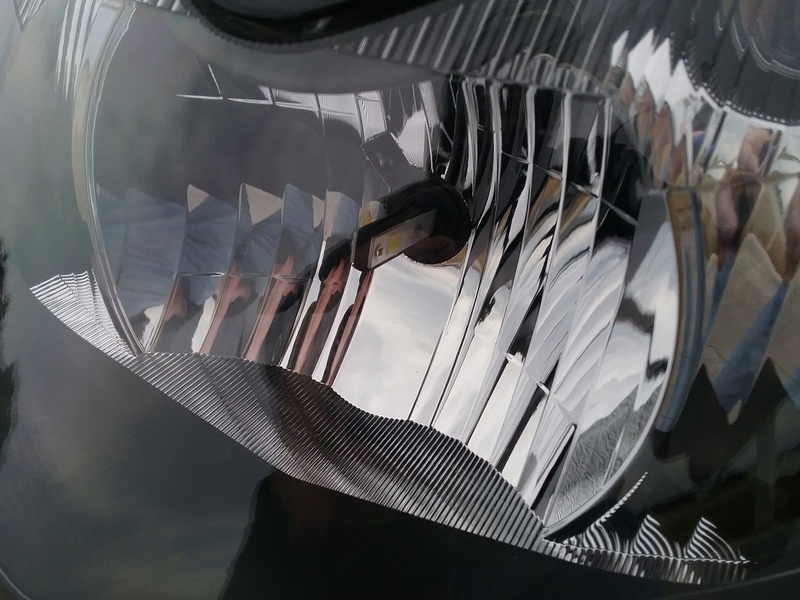 See the sharp cutoff on the "LED headlight off" picture compared to "LED headlight on"? That's why you need a proper reflector/projector designed for your bulb. In addition to having clearly lit trees, you'll be blinding every oncoming driver. Overly bright headlamps, especially those with bright foregrounds and sharp cut-off, create another quite dangerous issue as well. The bright field causes your pupils to contract, greatly reducing your vision in lesser and non-illuminated areas beyond the bright foreground and outside the cut-off. Overly bright foreground lighting exacerbates this. This is a common misconception as to the shunt rectifier/regulators (R/R) used in most bikes. Current flows from the generator coil, through a rectifier in the regulator, to the battery and load, and back to the generator coil. Heat relative to the external load is being generated by the rectifier's forward voltage drop (an inefficiency; all electrical components are inherently inefficient.). 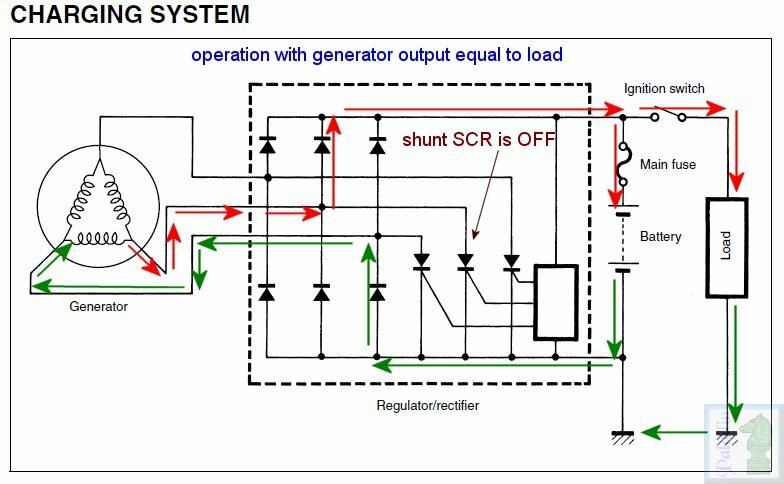 Here the regulator is doing it's thing and has activated the displayed phase's silicon controlled rectifier (SCR) "shunt" sending the unused portion of the coil's output back to the coil through that SCR. However other than the forward drop of the SCR and coil impedance there is no other load on the bypassed power, generating very little additional heat. 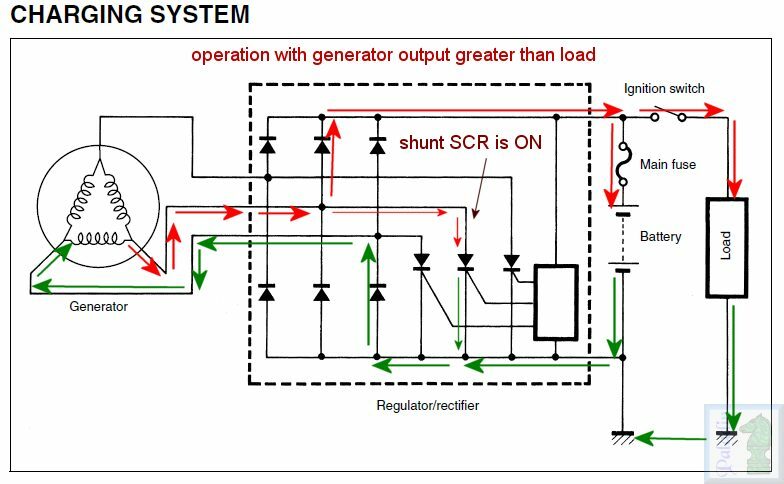 This "very little" heat does of course increase the overall heat dissipation of the R/R device, however as the shunted power is simply "circulating" in the generator it's not as dire a situation as the misconceptions, and misleading dribble spouted by aftermarket R/R vendors would have one believe. After changing out the halogen lights in my car a year ago and seeing the amazing difference the LED lights did in visibility both forward and sideways I decided to change out the halogens in my recently acquired 2013 Silverwing. After laying out what needed to happen they easily installed and made an amazing difference in visibility. 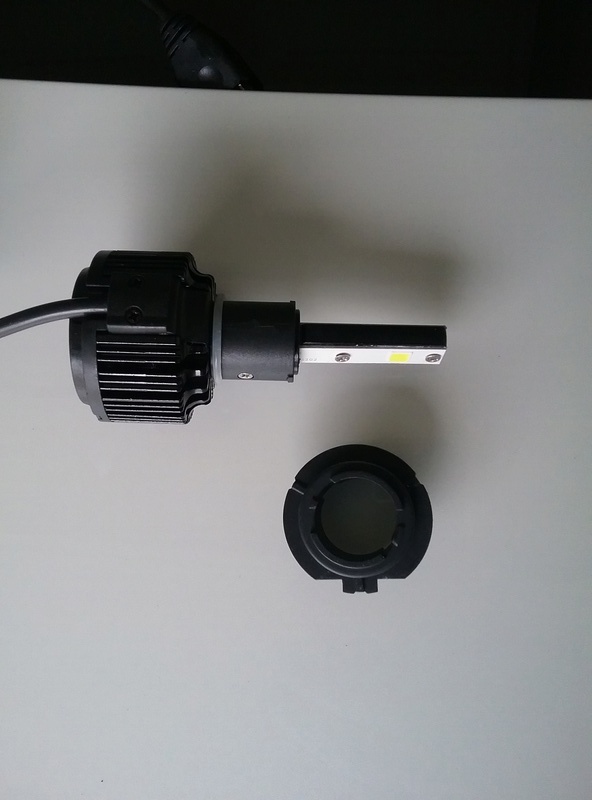 these LEDs are only 40 watts each and have the heat sink with cooling fan as part of the assembly. Something to do with a screw? Archimedes! Wasn't he the Eureka! guy? or am I just making it up? I noticed the plug in ends were spade connectors not a single plug, kinda cheesy. I found a set with the correct plug and it's an easy plug n play type replacement with amazing results both for daytime and night riding.